Opened in 1947, Bree's Animal Hospital is a small animal practice that offers you and your pet a variety of different pet care services. From thorough exams and diverse surgeries to affordable boarding and professional grooming, our experienced staff is ready to assist you in providing compassionate and complete care for your beloved pet. Dr. Conrad Roblejo graduated from the University Of Havana, Cuba in 1961 with a degree Veterinary Medicine. Over the years he has owned multiple practices in both Pennsylvania and New Jersey and previously served as President of the Keystone Veterinary Medical Association. In 1990, Dr. Conrad became the owner of Bree’s Animal Hospital. He continues to show compassion and kindness to every patient he examines and has special interest in Orthopedic and Soft Tissue Surgery. In his spare time Dr. Conrad enjoys singing Opera and spending time with his Family and his Grandchildren. 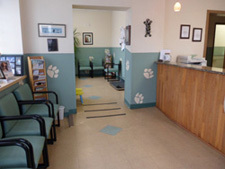 At Bree’s Animal Hospital, we are committed to providing the best quality health care for your pet. Using the highest medicine and latest technology, our Doctors and Staff offer a wide variety of services from routine vaccinations and health exams to complex surgical and dental needs.